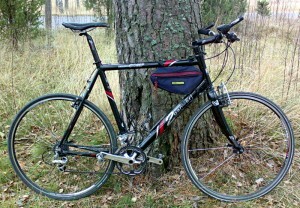 The winter – meaning, snow and ice – is not yet coming to our region, but I somehow feel that the roadbike season is over. With this thought in mind, I rebuilt my road (or cross) bike with flat bars. I’m not an advocate of drop bars anyway. IMO they are reasonable for just two cases, either riding really fast (meaning, races or sportive group rides), or riding really long (meaning randonneur rides). I’m curious about people who prefer drop bars for commuting (this style seems to be popular in the US). I’d never hold on the drops between home and work, and always holding on the hoods is, IMO again, vastly inferior to good old flat bar. Not to mention that the brakes with drop levers are never as ergonomic and efficient as with conventional flat bar ones. So, as I’m not expecting any brevets or fast road club rides this autumn any more, I installed the wide flat bar on what originally was a “cyclocross” bike. The only other replacements are the stem and the front brake. The latter is swapped from a cantilever to a V-brake with a booster. I left the rear brake as it was; braking with “V-levers” on a cantilever brake is very poor, but for me the rear brake is almost of no use, except as a backup. Rear shifting is compatible between road and mountain Shimano shifters (thanks Shimano; SRAM was not as smart as to provide such convenience). Front is not (no thanks Shimano! ), but as far as the crank is double not triple, it is easy to set up the shifter with bigger cable travel to work. 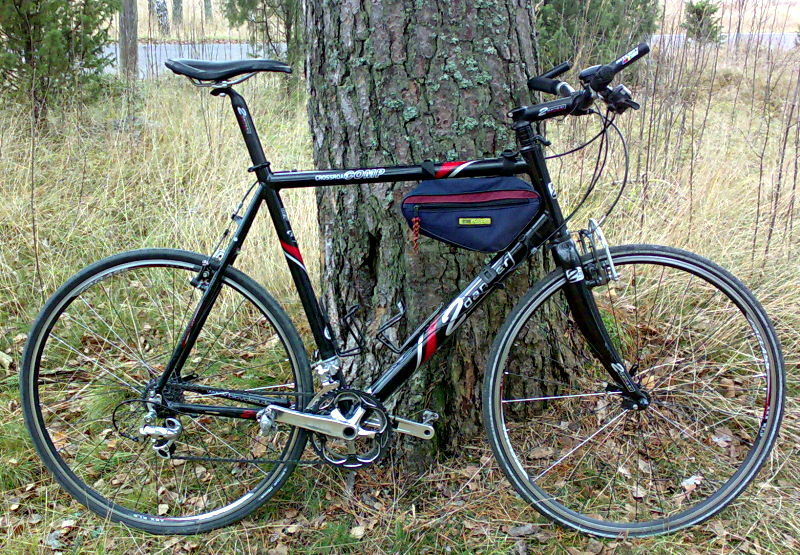 This entry was posted in Cycling by konstantin. Bookmark the permalink.